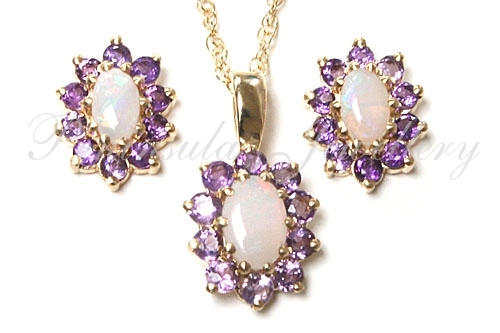 Pendant/ Earring Sets > 9ct Gold Amethyst and Opal Oval cluster Pendant, chain and Earrings. Pendant; Traditional cluster pendant featuring ten 1.5mm round brilliant cut Amethyst gemstones which have been claw set, with one 6x4mm Opal gemstone in the centre. Complete with 9ct gold fittings. Dimensions: 8mm wide, 15mm long including fixed bail. Complete with 9ct gold 18" Prince of Wales chain. Earrings; Stunning stud earrings, featuring one 5x3mm oval Opal gemstone surrounded by 1.5mm brilliant cut real Amethyst gemstones. Standard 9ct gold fittings. Overall dimensions: 9x7mm. Made in England. Presented in a luxury gift box – Great Gift! !